​Are you Ready to Start Enjoying your Pool? ​​Quality Pool Care provides local maintenance & repair to pool owners in Brazoria County and Bay City area. Our mission is simple - care for each client's pool as if it were our own, listen to feedback and respond promptly. We are proud to be Family & Veteran Owned company! Our focus is on providing a quality service with customer satisfaction! 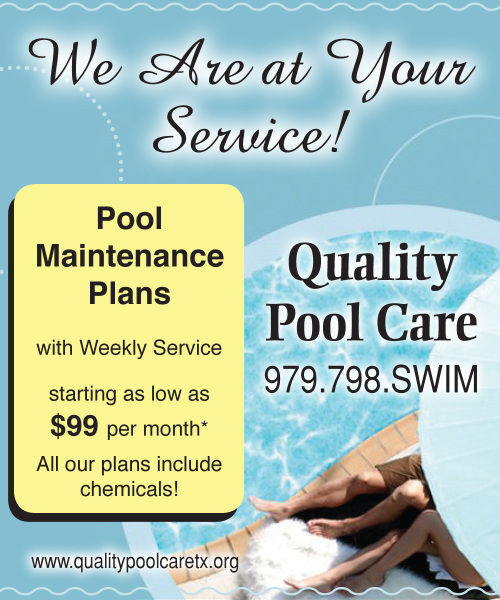 Quality Pool Care offers several Maintenance Plans to better fit your pool needs and budget. Click here to learn more about these great plans. Want to learn more about our 100% Satisfaction Guarantee for customers on our Pool Maintenance Plans with us. Just click above. We work diligently to provide you with quality care at an affordable price. Our friendly staff is at your service! Check out all of the services we have to offer.